Orlando Pirates goalkeeper Wayne Sandilands admits he was disappointed not be included in the Bafana Bafana squad for the upcoming African Cup of Nations qualifier against Libya on 24 March. Ronwen Williams and Darren Keet were expectedly named as two of the three keepers in the national squad but the big shock was the call-up of Kaizer Chiefs’ Bruce Bvuma who is not a regular starter at his club. 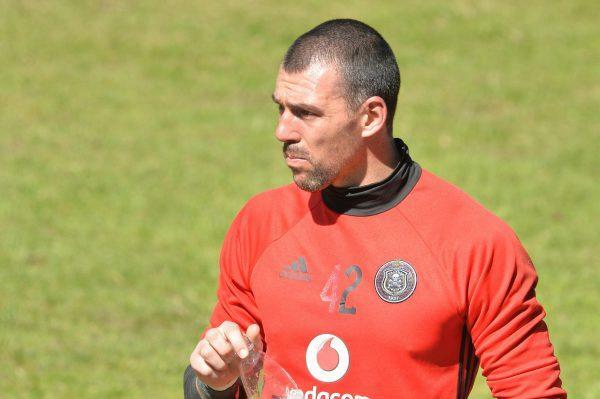 Many thought the 35-year-old Sandilands deserved to be selected as he has been in good form for the Buccaneers recently but he is not to fussed and is focusing on Pirates’ next match, which is a crucial Caf Champions League tie away to Horoya FC. In quotes published by SowetanLive, Sandilands said: “I don’t think there’s any player that sits there whose name isn’t called and is happy about it. “Obviously I was disappointed and I think every player can say that. The Pirates shot-stopper has eight Bafana caps to his name and insists he will never give up hope of playing for the national side as long as he is fit. Sandilands continued: “I don’t think the passion to play for your country will ever die. I think right up until the end, no matter how old I may be at that point, I will always want to strive to be in the national team. “Like I said, I was obviously disappointed because in your head you feel like maybe you can add some value there. But coach Stuart (Baxter) is such an experienced coach and he’s got a track record and an excellent one.